Volkswagen will debut its latest off-roader concept, the T-ROC at Geneva. The concept is based on the MQB platform and has a removable carbon composite split roof which also gives occupants of this SUV, the joy of open top motoring. The T-ROC is a two-door four seater with dimensions of 4179mm, 1831mm and 1501mm in order of length, breadth and height. The front features a 3D radiator grille with honeycomb design, daytime running lights, large round headlamp modules and LED headlights. The side gets 19-inch alloy wheels and huge, muscular looking wheel arches. The rear gets sleek LED lights, twin rectangular looking tail pipes. Front and rear both get skid plates to aid crossing rocky terrains. This SUV gets its power from 2.0litre, turbo diesel engine which produces 184PS and 380Nm of torque available from a low 1750rpm. A new seven-speed DSG gearbox provides power to all the wheels through a 4Motion drive system, getting the car from 0-100kmph in a claimed 6.9 seconds and top speed of 209kmph. Company says that combined fuel efficiency is 24.4kmpl and carbon emissions are no more than 129g/km. The T-ROC also has integrated front and rear view cameras which while driving off-road sends images to the centrally mounted 12.3inch colour display tablet. This helps the driver to navigate the car around potholes and large stones. There are three driving modes on offer for varied terrains  street, off-road and snow. They can be selected by turning a wheel on the DSG gearshift grip. The T-ROC is a compact SUV which is smaller than the Tiguan but larger than Taigun SUV concept. The T in the T-ROC refers to the current crop of Volkswagen SUVs, read: Touareg and Tiguan and the ROC refers to at home on rocky terrain. 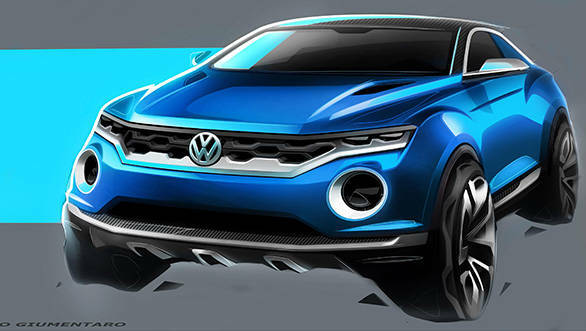 Meet the T-ROC, the latest Volkswagen SUV concept, which is making its debut at the Geneva Motor Show. The T-ROC offers a glimpse at future Volkswagen SUVs: it is smaller than the Tiguan, but larger than the Taigun SUV concept, which is in the development phase. The two-door, four-seat T-ROC combines the agility of an all-wheel-drive SUV with the airiness of a convertible, thanks to its roof design. The middle section of the roof  made from a carbon composite  can be removed in two halves, each of which can then be stored in the boot. The T-ROC concept measures 4,179 mm long and 1,831 mm wide, making it around 200 mm shorter than a Tiguan, and around 300 mm longer than the Taigun concept. At 1,501 mm tall it sits around 200 mm lower than a Tiguan. Like the latest Golf, the T-ROC is based on the modular transverse matrix (MQB) platform, and thanks to its lightweight design, it weighs just 1,420 kg. The vehicle's proportions are distinguished by relatively short overhangs (front: 811 mm, rear: 772 mm) and large track relative to its body width of 1,578 mm (front) and 1,564 mm (rear). The wheelbase is 2,595 mm. The wheels are 19-inch alloys with 245/45 tyres. The team at Volkswagen Design, led by Walter de Silva and Klaus Bischoff, have advanced the brand's 'SUV DNA' in the T-ROC, while also preserving its history. Immediately striking are the 3D radiator grille with large honeycomb-shaped opening, LED headlights, daytime running lights and indicators and prominent round headlamp modules which hark back to the Karmann Ghia Type 34. At the rear, LED elements also abound, with strong, purposeful design. Both at the front and the back, the T-ROC makes use of integrated cameras which project images when driving off-road into the cabin via a tablet mounted in the centre console. This allows the driver to see potholes or large stones which could damage the car  or certainly hinder progress. Power for the T-ROC is provided by a high-torque (380 Nm from 1,750 rpm) and fuel-efficient 184 PS turbodiesel engine connected via a newly developed seven-speed DSG gearbox to a 4MOTION all-wheel-drive system. This engine will be familiar to drivers of the new Golf GTD. Top speed is 130 mph in this concept car, with zero to 62 mph in 6.9 seconds. The T-ROC is predicted to have a combined fuel consumption of 4.9l/100km (57.6 mpg), equating to 129 g/km of carbon dioxide. Three driving modes  'Street', 'Offroad' and 'Snow'  are selectable at the turn of a wheel on the DSG gear-shift grip. Parameters of the running gear, engine-gearbox unit and hill start and hill descent assist systems are modified depending on the mode selected. 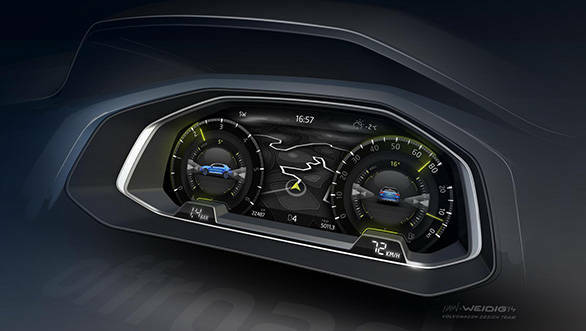 The active mode is shown in a pop-up window in the fully digital instrument cluster. In addition to the digital cluster, the T-ROC also features a 12.3 inch colour display tablet which is firmly locked into the dashboard with the upper two-thirds of the display extending out from the dashboard. The multi-touch display (which reacts to finger gestures) is user-configurable, and the range of colours used and information displayed on the tablet change according to the driving mode selected. The T-ROC's name is derived from 'T' as a reference to the names of current and future Volkswagen SUVs such as the Taigun, Tiguan and Touareg, and 'ROC' meaning the all-wheel-drive car is as at home on 'rocky' trails as on tarmac.